Congratulations to Keesha Cheechoo from Canadore Television program on winning national awards. We're doing something right! We won two BEAC awards, one for Drama or Comedy Long in the Film Program and one for Remote/Special in the TV program. 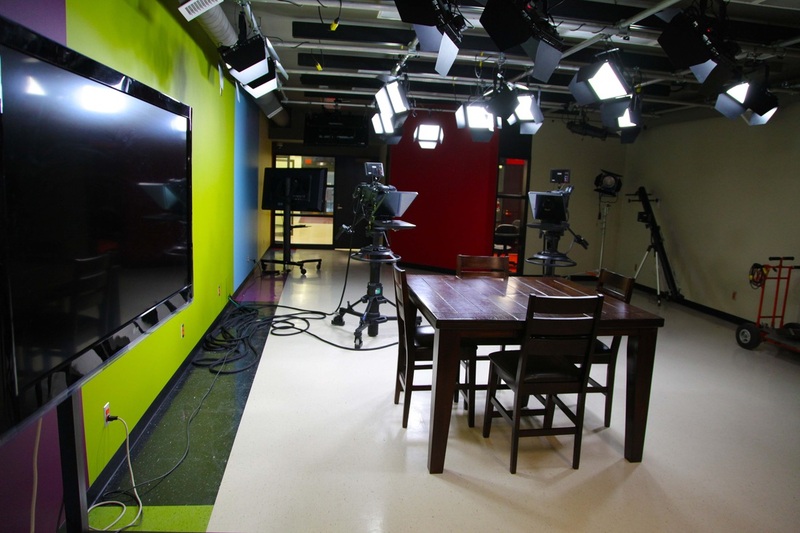 The Broadcast Educators Association of Canada, is a national organization dedicated to promoting excellence in Media Education. This is awesome news for the students, faculty and the College. Chelmsford, Massachusetts – Jan. 10, 2016 – As part of a unique partnership, students from Canadore College of Applied Arts and Technology in North Bay, Ontario, use a Broadcast Pix™ Granite™ 2000 integrated production switcher to provide scoreboard video coverage of the North Bay Battalion hockey team at the North Bay Memorial Gardens Sports Arena. 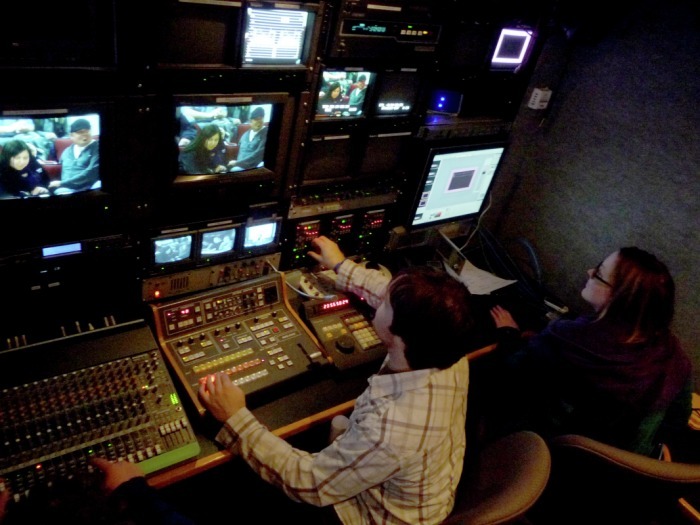 The city owns the arena, and the Canadore staff built the control room and provides engineering services for its video equipment. 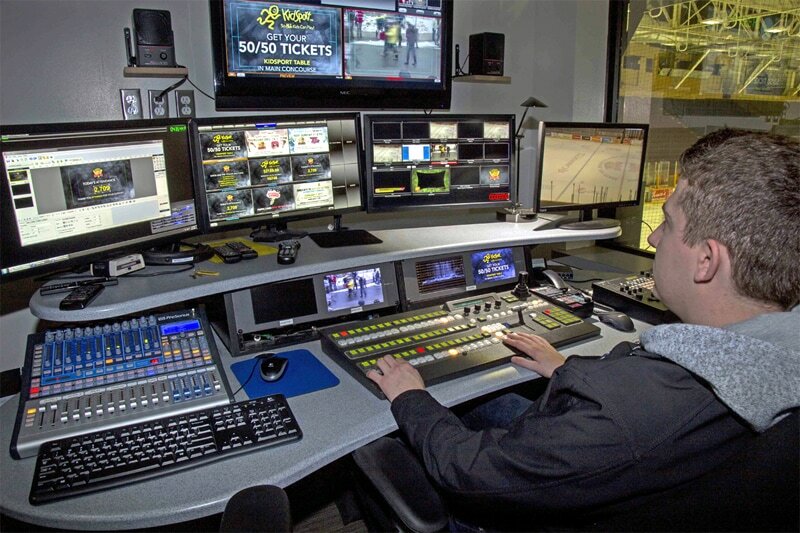 Installed in late 2015, the Broadcast Pix system was part of a $16.2 million arena renovation that included an HD video scoreboard above center ice and an updated control room to support full HD production. 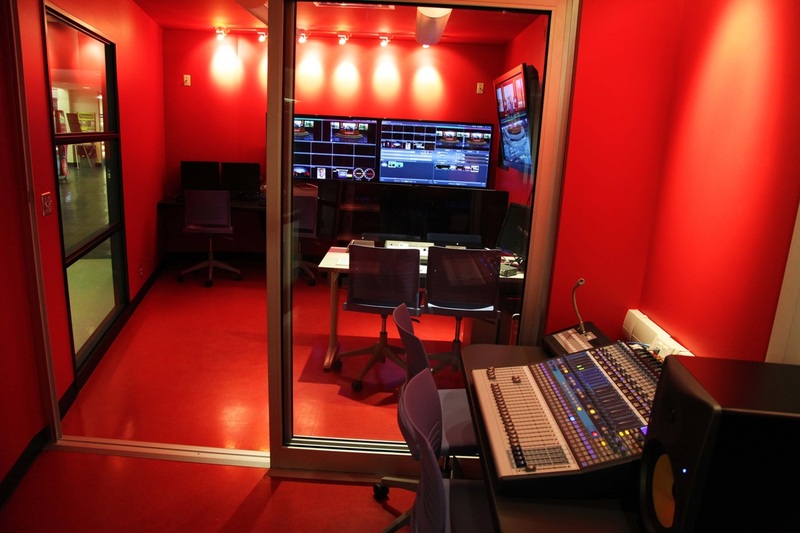 Yura Monestime, interim associate dean for media, design and dramatic arts, recommended the Granite because it provided more inputs and functionality than the previous switcher. 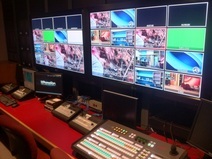 The Granite’s integrated multi-view populates four different monitors in the control room, including preview/programs monitors for the director and separate monitors for clips and graphics stations. Monestime said the operation also uses Broadcast Pix’s Watch-Folders file management system to import graphics and clips directly into the Granite. Part of the Ontario Hockey League, the Battalion relocated to North Bay in 2013. Melinda Fry, the city’s manager of sports and events, said the team reached out to the college to recruit students to produce the video scoreboard presentations. Now, a city employee (and Canadore graduate) oversees the productions, but students run almost every aspect of game day productions, including cameras, graphics, and slo-mo replay. The video scoreboard game coverage uses three cameras. The main camera, a remote PTZ, is positioned at center ice and stays wide, while a second camera with studio configurations is controlled by a student and provides a tighter view of the action. Academy Award winner Roger Christian will be addressing students from Canadore College’s School of Media, Design and Dramatic Arts on Monday. Christian is in North Bay on the set of Joseph and Mary, a biblical drama being filmed in North Bay, Ont. With an amazing history in film, including his role as art director on Alien and winning an Academy Award for set decoration on director George Lucas’s Star Wars: Episode IV – A New Hope. He also holds directing credit for major productions such as Nostradamus, Final Cut, Underworld and Masterminds. This is the third installment of a series of workshops designed to bring industry experience and talent into the classroom. Producer and director Lief Bristow and editor Mark Arcieri have also shared their craft with students this semester. An entire studio is wrapped up in one small package that can be transported anywhere to produce high quality live event productions. 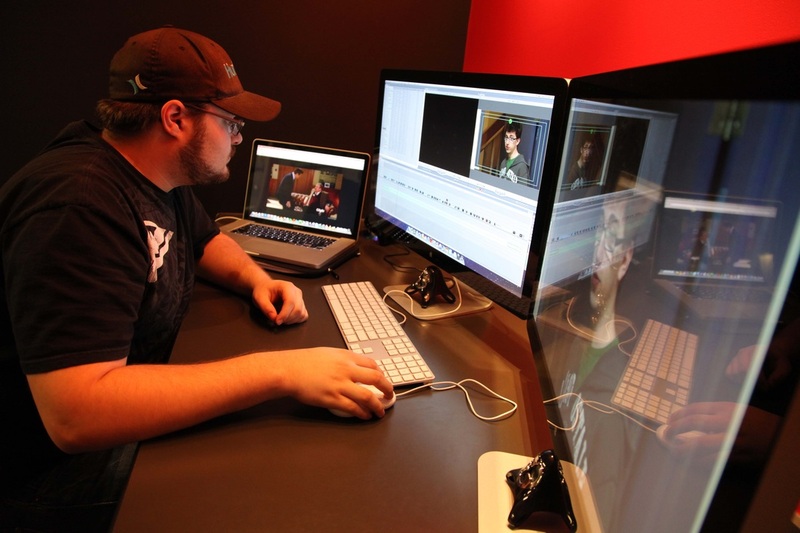 To keep up with rapidly changing technology, Canadore opts to stay ahead of the curve by modifying the way it teaches the next generation of media and digital content specialists. Viewer preferences are forcing traditional TV stations to change the way they create and deliver content. Canadore is in step with this evolution, with the use of their new innovative mobile media station that takes production out of the studio and into the field. This new content creation mobile station will be used to cover sporting events, music concerts and conferences, offering HD quality and up to eight cameras, all wrapped up in a 5 by 4 foot transformer-type container that is easily transported. 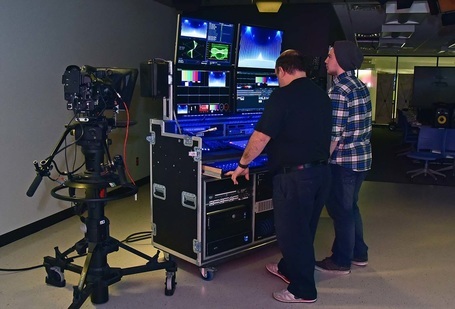 There are continual enhancements being made to the TV and Video Production program to meet the needs of present and future technologies, over the past few months in particular with this latest creation. If you would like more information on the program or how to gain access to the new technology please contact Yura Monestime Interim Associate Dean of Media, Design and Dramatic Arts at yura.monestime@canadorecollege.ca or visit our website canadorecollege.ca/media. 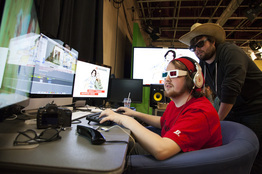 Students from Canadore College’s media programs will have the chance to learn how they can tap into funding and lending mechanisms to bring their productions to life. Leif Bristow, a world renowned producer and director, will be speaking to students from Canadore’s Broadcast Television, Digital Cinematography and Theatre Arts programs. Bristow has extensive expertise in this area having coordinated approximately $30 million in financing as senior vice president of one of North America’s most award-winning developers and producers of family-oriented film entertainment. He produced films and series for the feature and television market focusing on elements of human drama, inspirational stories and family content. Bristow is known for The Red Dress, Sophie and Sheba, Blizzard and Kart Racer. He is currently working on another eight productions. Video Production and Digital Cinema students produce video for awareness campaign on dangers of texting and driving. MOCKDISASTER H264 from canadoremedia on Vimeo. Welcome back students. You can feel the excitement in the air. Aaron Skilton, from Barrie North Collegiate, earned a silver medal in the 2014 OTSC in the Workplace Safety Contest. Aaron will be furthering his education at Canadore College in their Television Broadcasting Program. Last week we had our graduating ceremonies which ended a great year.Good luck to all graduating students. 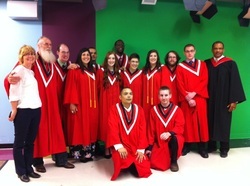 Canadore TV students produce National Telethon. Another successful Lions Christmas Telethon. 1st and 2nd year Tv students produced the annual Lions Christmas, Telethon that was broadcasted nationally over Bell Tv and streamed to the internet. Over $40,000.00 was raised in 9 hours for the needed. Under the watchful eye of 3D specialist Jake Seal, TV and Digital Cinema students finish intense 8 day workshop on 3D production. Learning how to build and shoot with a 3D rig, use Nuke and Speedgrade software. See pictures section for more photos. 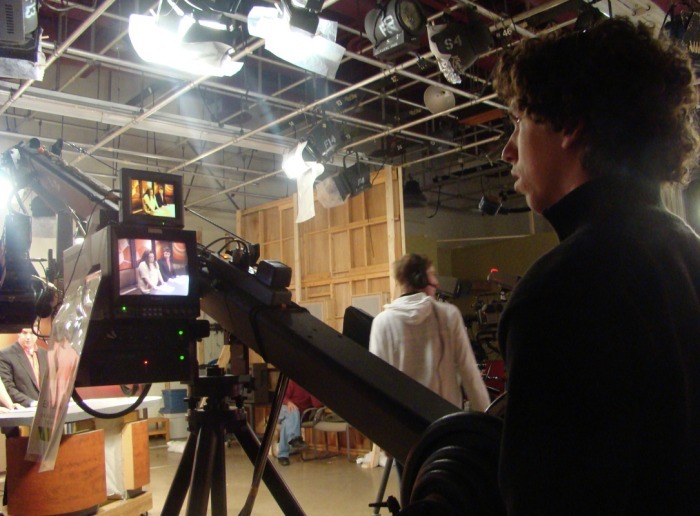 Graduates from the 2nd year TV Program can jump into the 2nd year of the Digital Cinematography Program. 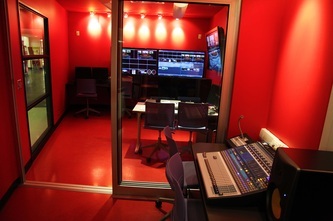 the most advanced digital production studios in Ontario. 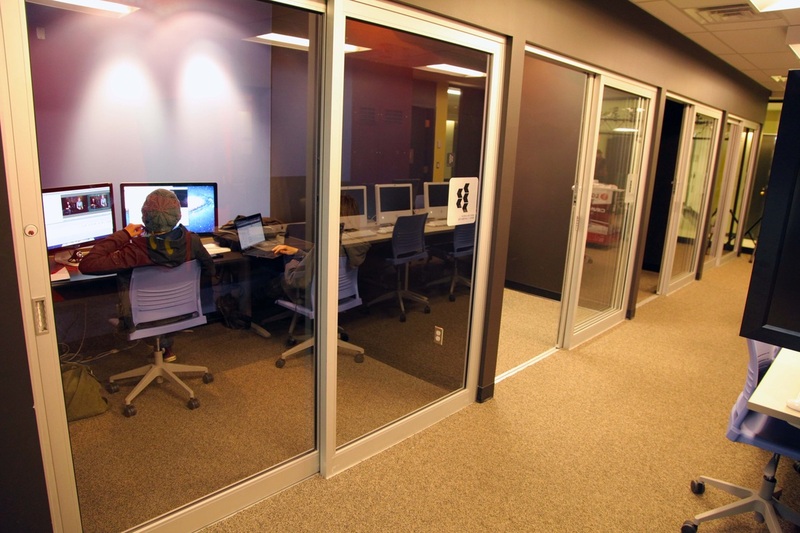 The Integrated Media Centre features leading-edge equipment and technology giving students a real-world experience like no other. Housed within the new 2,000 sq-ft media hub is the camera of filmmakers’ dreams - the ultra high resolution RED Epic digital camera. program the opportunity for unique and coveted hands-on experience. The Hub, as the IMC is referred to at the College, provides students with open access to new equipment and emerging multimedia technology. Investments were made by Northern Heritage Fund and Fednor in the amount of $1 million each. The Hub’s other new features include a 850 HD Tricaster switcher with Panasonic HD cameras, Sony F3 Cinema cameras, a steadicam and field audio equipment, LED studio lights, private edit suites and a master Red edit suite with a built in Red Rocket card, a 15x12 corner less green screen, an HD Carbonite switcher, HD Extreme graphics and the Ross Softmetal server . Recent Television graduate, Chantal Garcia said her class loved the opportunity to train on this advanced equipment. be a technology base for new program development. 2014eastwest cheers 1 from canadoremedia on Vimeo. D.O.P. 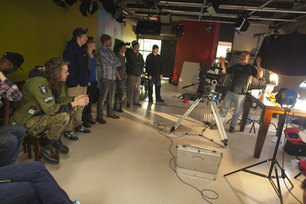 cameraman Michel Bisson held a lighting seminar in Studio 2 today. His subject was food and how to light it. About 25 students came out to see Michel work his magic and make food look really good. Michel a proud member of the CSC “Canadian Society of Cinematographers”, C.I.C.A. “Canadian Independent Camera Association” and I.A.T.S.E #667. Our old studio has been completely reworked into a State of the Art HD studio. At the heart of the new refit is a Carbonite 2 switcher, Xpression graphics and Black Storm servers. Three Canadore College students from the Television and Video Production program took home national awards at the annual BEAC conference. BEAC (Broadcast Educators Association of Canada) is a national organization dedicated to promoting excellence in Media Education. Students Jake Young, Mason Pridham and Andy Repa won for Best Corporate Video and the prestigious President’s Award, which is the Best in Show award. 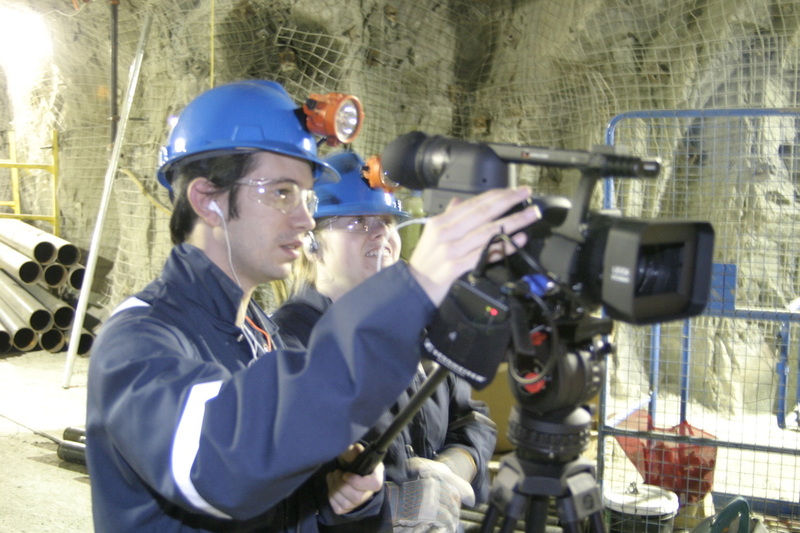 “Canadore students are trained to excel in real world scenarios and use the knowledge they are taught in video production and the transferable skills from other courses in the program. They did a great job with this video,” said Yura Monestime, Professor/Co-ordinator for the Broadcasting – Television and Video Production program. The competition included videos from colleges and universities from all over Canada. The students wrote the script, produced, shot and edited the video, which will be used as a promotional piece, for the client. The satisfied client was Essential Helicopters, a North Bay company that offers helicopter services in and around northern Ontario.